Outstanding sixth grade band students from the Warwick elementary schools recently participated in the Pennsylvania Music Educators Association Youth Honor Band 2018 at New Oxford High School on November 16th and 17th. The students that attended the event were: Jacob Soslow on percussion, Gannon Ziegler on trombone, Jacob Evans, Caleb McCamant, and Trey Mitchell on trumpet, Carly Ruchalski on alto saxophone, Piper Stauffer on clarinet, and Kaelyn Jones and Ethan Martin on flute. These talented Warwick students joined 185 fifth and sixth grade band students from eight Pennsylvania counties to learn a variety of selections, including the music from the movie, ‘The Incredibles.’ Attending this two-day musical event required these musicians to dedicate additional time and energy to perfect their music, which culminated with a Saturday afternoon concert. 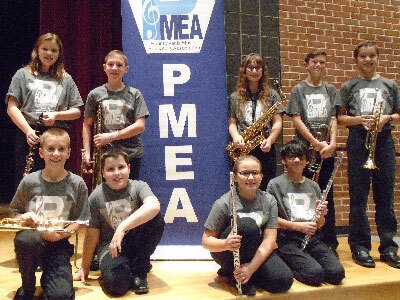 Pennsylvania Music Educators Association is a statewide nonprofit organization of over 4,500 members, dedicated to promoting the musical development of all Pennsylvanians. Congratulations to these hardworking elementary band students.